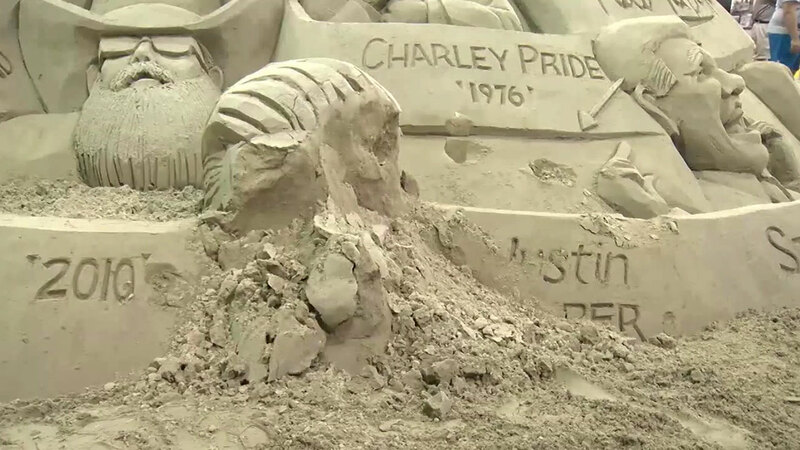 A sand sculpture featuring Justin Bieber's face was smashed after a vandal threw themselves on it at the New York State Fair. NEW YORK -- Another person can be added to the list of people who dislike Justin Bieber. Authorities searched for a vandal who smashed the singer's face set in a sand sculpture at the New York State Fair. It was part of a much bigger piece that featured the likenesses of several other notable figures. Bieber's face was near the base, below Charley Pride and to the left of Steve Martin. Witnesses said the man threw himself into the head of the Justin Bieber sand piece, then ran out the auditorium door. Authorities said the man may have been intoxicated or could have just had a particular issue with the Biebs. Unfortunately for Beliebers, the sculpture won't be repaired by the time the fair ends.